Designed to hold your funnel at the ready and catch errant drips when you're done. Stainless steel so there's no tainting or tarnishing. Great taste takes a stand! Due to popular demand, we've put our Aerating Funnel with Removable Screen on it's own storage stand. Designed to hold your funnel at the ready and catch errant drips when you're done. Stainless steel so there's no tainting or tarnishing. The removable screen filters sediment and cleans easily. Note: Stand can not be purchased separately. I have one of these funnels, but I lost the filter/screen in a house move. Do you have replacement filter/screens? BEST ANSWER: No it does not fit. The end is closed with side holes only so it would not work as a simple funnel in any event. I have a nest of 3 soft silicon kitchen funnels I use for tasks like this. Handy for many things. Yes, the funnel will fit into the neck of a standard bottle. But, you may not want to expose the wine to any more air! What is the metric weight of this funnel to the hundredths place? How many millimeters is it? 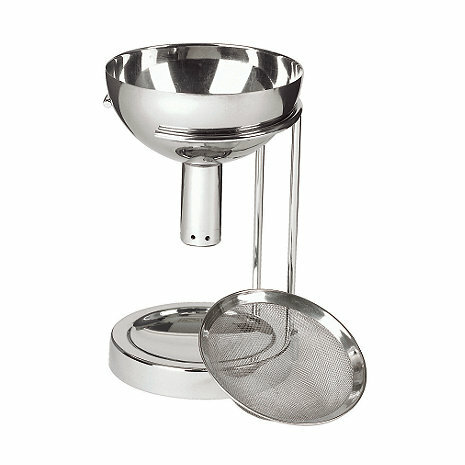 BEST ANSWER: Thank you for your question, the funnel w/ stand measures :146.05mm tall. What are the care instructions? Are all of the parts top-rack dishwasher safe? BEST ANSWER: They will be fine on the top rack of the dishwasher! Hello! Can one just pour wine directly into a glass and not use the decanter and get the same effect of aerating the wine a glass at a time? Thanks. J.K.
BEST ANSWER: You can aerate directly into a glass. You will get similar results but a decanter does have more surface area so works better in a decanter. We prefer red wine and some of them have more than a fine sediment. This product looked like the ticket especially for bottles that have been stored awhile and are a deep color. I've tried decanting by watching the wine flow through the neck of the bottle backlit by a candle. I still can't see the sediment on some of the darker wines. So I decided to try this and eliminate the guesswork and eyestrain and have been so pleased with the performance of this. I use this funnel and filter when decanting wines. It seems to speed the process. It is also an attractive item on our wine bar. Truely makes a difference in taste!! It truely does make a difference in the taste of your wine! When I saw a friend using one my initial response was "how snooty". So we did a taste test on four wines. With and without the aerator. Using the aerator enhanced the taste substantially. I don't think you will be disappointed. This aerator is great. Someone in another review said it didn't filter out sediment. I've use it with several bottles with lots of fine sediment and the filter caught every piece. You just have to pour slowly. Looks great and stand is very practical. We use the aerating funnel with our "O" decanter and it further aerates wine and looks attrative as it pours wine down into decanter. Beautiful to watch. This is a great product. We had a bottle of wine decanted for us at a restaurant with one of these and we knew we had to have one. Guests will love watching it and it is great for the wine. Easy to clean, easy to use, and (best of all), it does it's job. Recommend! Very simple way to remove sediment and aerate the wine before drinking. This was a perfect gift for the true wine enthusiast. I think that the stand makes the whole thing, you are able to set it on the stand and it drips into the bottom vs all over your counter. What a great product. Every red wine drinker should have one. Easy to use and clan, holder is stylish and convienient. Makes the wine ready to serve and elinates any sediment concerns. I needed a strainer for some of my older bottles and found this unit with the funnel and stand. The funnel surprised me as it has no hole in the borrom but holes around it to further airate. Great design! Great accessory for the wine collector. This gift was a big hit with my family. I needed a replacement aerating funnel for one we had misplaced and this one was even better than our previous one! Great value and shipping! Aerating funnel - great product! The product functions as marketed. It doesn't get any better. We have bought several and we will be giving them to each host/hostess when we go to dinner at others homes. We decant most of our wine before serving. The fine mesh of this funnel captures all the sediment perfectly. Its design is simple and elegant and it works like a charm. Easy to clean and store too. GREAT tool and fun to use! I always get great service and delivery from WineEnthusiast.com! Thank you. I like the aerator and the fact that it has an easy to clean screen to catch any sediment. Plus it looks great on the bar. Elegant, practical and easy to use. Not always apparent in one product. I often give decanters and related devices as gifts to my wine lover friends. It's a wonderful device to filter older wines with impurities or broken cork debris. This is a simple, yet brilliant design for a wine aerator and it works beautifully. Much easier to use than some of the other products we have tried. Great for aerating reds that are opened years before their time. I recently tasted two glasses of a 2007 Cotes du Rhone, one straight from the bottle and one aerated. Noticable reduction in tannins (for the aerated glass), but no noticable difference in nose for the two glasses. Stand is a definite plus, as it catches drips from the funnel after use. Looks great and is easy to use. It takes a while to filter the wine so you need to be careful not to overflow the bottle. We have quite a few old and good wines which we cellar. An aerating funnel with a separate strainer for the sediment creates two positive effects,areation and removal of the dregs. It makes this a short and simple job. The funnel and strainer are simple to clean. The size of the stand holding the two items is compact for storage. The funnel may also be used alone. I give this for gifts! This is such a nice way to get the wine to breathe faster. I love the stand for it, so I don't get wine drips on the counter. Very nice design. Works well. Keeps the drippage under control. Fun to watch during decanting. This device does a wonderful job of aerating your wine in conjunction with your decanter. Absolutely love it. It certainly works as advertised and as expected. High quality and convenient. Simple, easy to clean and use. Met all expectations. No more cork in the glass. Handy and looks great on the counter top. Love the removable screen and it's very attractive to display on the bar! Funnel holds only a small amount of wine and has only four small holes for draining. Hence, the decanting time is very slow. This is the only drawback. Stand is nice and stylish. It really compliments the piece. The funnel is great for pouring into a older style glass decanter. It greatly improves aeration and opens the wine up. It is awkward to use for single glass of wine aeration. Made with very good quality stainless steel and durable construction. If I can get my husband to use it. He seems like he can't be bothered with the extra step, but the funnel seems simple enough to use and seems to do a good job aerating. It's been through the dish washer and came out fine. Shipping and handling makes the product a bit pricey. It should include instructions to slowly twist the funnel about 1/3 turn while pouring in order to get the best decanting coverage, otherwise the wine does not cover the decanter walls properly. Really like the way this funnel works with reds. We have quite a few old reds and the sediment is screened out. Has made my decanting much easier! Bought this thinking it would be a big help getting my wine back into the bottle after decanting however, the funnel will not fit in the bottle so I purchased this and can't use it for what I purchased it for. I have an aerator that I usually use to transfer the wine from bottle to decanter and have started using the funnel for this purpose as well. It fits nicely into the mouth of my decanter and does a better job than the aerator when there is more sediment present. was a great christmas gift for my mom who didnt own one and got jealous when she thought it was mine.